The Toronto Maple Leafs have signed center Auston Matthews to a five-year, $58.17-million contract extension. The annual average value is $11.634 million. Toronto Maple Leafs sign Auston Matthews to a five-year extension (Photo via NHL Images). SPECTOR’S NOTE: And with that, the threat of a rival club swooping in with an offer sheet for Matthews this summer is negated. It’s a significant raise for Matthews, who is completing the final season of his entry-level contract. Selected first overall in the 2016 NHL Draft, Matthews swiftly developed into a top offensive center, winning the Calder Memorial Trophy in 2017. Despite missing 14 games to injury this season, he’s tallied 23 goals and 46 points, putting him on pace for 40 goals and 82 points by season’s end. Both sides were reportedly interested in an eight-year extension but doing so apparently wasn’t in the Leafs’ long-term interests. This deal also gives Matthews the opportunity to negotiate another major contract by age 26, when he’ll be eligible for unrestricted free agency. Starting next season, Matthews’ new annual cap hit will be the highest on the Leafs and the league’s second-highest behind Edmonton’s Connor McDavid’s $12.5 million. While Matthews didn’t exactly get “McDavid money”, his new cap hit will still take a big bite out of Toronto’s payroll for 2019-20. The Leafs now have over $71.9 million invested in 14 players, with Mitch Marner, Jake Gardiner, Kasperi Kapanen, Andreas Johnsson, Ron Hainsey, Garret Sparks, and Igor Ozhiganov to be re-signed or replaced. Even by placing Nathan Horton ($5.3 million) on long-term injured reserve at the start of next season, and assuming a projected cap of $83 million for 2019-20, the Leafs won’t have enough to re-sign everyone. They’ll likely have to shed a contract or two before the start of next season. Marner, of course, is the Leafs’ next priority and could cost around $11 million annually to keep in the fold. He’s indicated he’ll wait until season’s end to open contract discussions. 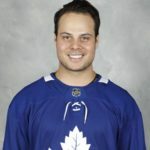 It’s a good bet the Leafs will try to get him locked up before he becomes a restricted free agent -and a potential offer-sheet target – on July 1. Good news. Marner will likely do the same thing – mid-term length and big money, likely front-end loaded with bonus money. Here’s hoping they stay healthy and keep developing, and that Kyle Dubas figures out how to make all the contracts fit. How much do you pay a team to take that contract? Lyle, I always thought conventional thinking was to sign a player to the longest possible contract offer. What would he have wanted for 8 yrs? Second, will the Leafs be in a more vulnerable position to negotiate five years from now when he’ll want potentially more than that? For the player signing the maximum 8 years at such a young age means leaving money on the table and not cashing in on his best playing days. Players are in the prime in the mid/late 20s to early 30s and come 5 seasons from now when Matthews is a UFA he will be able to command more based on his past performance, as well as the (safe) risk that the cap will rise so even an increased salary can still fit in a team cap. For the team it makes sense because they can pay him a bit less for 5 years, which means Marner will take a bit less then that for probably a similar period and they can best fit these salaries. Because of the Marleau contract, next year’s cap is going to be tight. Horton’s contract will offer some relief but not enough. The following year Muzzin will have to be resigned or traded and my thinking is he will be hitting paydirt with Marleau off the books. All in all, next year will be the most trying year and don’t forget, the cap is only going up in the future. WOW. That’s a lot money for 5 years. As i posted yesterday imo Matthews (and Marner) should not get more than Tavares. I was hoping both sign a bridge deal between 3-5 years between $8 and $9 million. Obviously daydreaming… WOW $11.634 million…..
Has anyone noted if this contract comes with a no trade or no move clause? Arnt those only available for ufa years? not 100% on this but I don’t think a player is able to negotiate a NTC or NMC into his contract until he has 7 years in the league or is a certain age. A NMC kicks in on the final year. The last year has the no trade. NTC contracts can’t be for RFA years. The last year of the contract, he would have been a ufa, so that’s when it kicks in. Imo not a teamfriendly contract. Crosby, McDavid, Tavares all left money on the table to win. What would he have comanded for 8 years? Welcome to cap hell Maple Leafs. Mathews left money on the table. The contract is less % of cap as compared to the cap hit% of the Crosby and McDavid. Agree that it’s not exactly team friendly but neither are 2 of the 3 comparables you suggest. I’ll try to add something here. I’m not a huge fan of the deal as I would of like one more year and maybe a $1M less but in retrospect, I think it’s better to over pay a superstar a couple of million than it is to pay a player bottom six or lower pairing players. Second, as much as I’m ok with the deal, his cap hit will take up only 14% of next year’s cap and looking back at other superstars, like Crosby and Malkins hit were 15% and 17% of the cap when they sign their extensions. Also it would be hard to argue that Matthews is right up there in the top 3-5 goal scorers 5on5 and a center at that. It’s not a truly ideal deal but I’ll take it and happy to see him in the blue and white for 5 more years cup chasing. Crosby & McDavid were MUCH better, when they signed. What money did he leave on the table exactly? Assuming his comparable was Connor McDavid at 12.5 million he left 850,000. That leaves room to resign Martin Marincin. He could have asked for 13 over 8. He’d have gotten it from someone. He left money on the table. Friedman just suggested it would have been in the ballpark of $14M over 8. That seems a little steep to me. Matthews is a great player but is he as good as McDavid? Yes the cap is going up but that is a big number. I know sticky. I suggested that months ago. The only way this turns out as a long term win would be to get Marner at 9-9.5x 8 yrs. I get that the Leafs May want to offer an 8 year monster deal after 5 yes but if he tests the market at that time what will it be? I think I’ll take that aspirin after all. So 33 million cap hit for Marner, Matthews and Tavares. Probably. Well, that GM knows what he’s doing, he’s built so many cup winners before. That’s a lot of money for a kid who hasn’t busted 70 pts in a season yet. Don’t get me wrong, I’d like him on my team, but he’s a point per game player thus far. Ultimately, I’m happy that the players are getting paid their perceived worth to their respective teams. Everyone win$ except for the guy paying to watch. Matthew’s couldn’t hold Connor McDavid’s jock strap. Not even in same league. Championship every where else he’s been remind me again how many current GMs in the League have cups? Your comments below don’t have a reply button, so I’ll answer here. Dubas hasn’t won a memorial cup and his oil team, the greyhounds never made it that far. Welcome back old Schticky, I see the Leafs have you on the payroll again as the leader of the cheer team. Got Muzzin for next to nothing but a pick??? You do realize they gave up a 1st rounder AND two prospects that were former 2nd rounders, right? Grundstrom has shown really well for the Marlies and LA choose Durzi over Liljegrin as the latter’s stock is plummeting fast. Even TSN was reporting that other teams scouts were saying LA made the right choice passing up Liljegrin. I’d say that’s not too bad of a haul for a guy that is a UFA in less than a year and a half. Good luck resigning him while be mired in cap hell. At least Matthews & Marner are actually deserving due to skill & heart. Couldn’t the leafs trade Marleau to a team that trades him back (hypothetically)? I was hoping there was some sort of handshake agreement with Lou—- structure contract with $17.5 M of $18.75 due in first 24 months … but have as 3 year contract to lower Cap AAV … then we’ll trade you after your SB is paid … you then retire and enjoy the fam….. receiving team actually pays $0 but gets cap hit ….. worth a 3rd rounder???? San Jose refused that 3rd year! I doubt they’re giving it back for a reunion and a favor to Toronto …. as a matter of fact, I seriously doubt that! As for Zaitz …., the incentive will have to be young Leaf forwards …. perhaps it’s Johnsson ???? Partick Marleau has 2 goals in last 16 games, I don’t think any team would want him. not much left for any depth. This is a concern of mine aswell I must say but that could happen to anyone I guess, bit part of my reasoning for the distaste of 8 year deals I have. A.M has been extremely fragile. I can see him & Nylander using binoculars to try and see the corners of the rink again. Yep you’re right I was thinking of McDavid who makes around 4 million. Just like the front loaded contracts of Luongo and Webber, I am thinking that these contracts will have some repercussions after the next CBA. Big signing bonus money each year with a low base salary. Don’t get me wrong, I’m not Leaf bashing, Connor McDavid has the same type of contract. Marner is going to July 1st and there is going to be a line. Half the Teams in the league will be waiting for the Leafs best offensive player to be eligible for an offer sheet.Kid is a beast. Toronto’s window maybe this season and that’s it. They better find some more help on the Blueline.